We went for a two day visit up to Alor Setar to visit Jacqui's uncle and aunt. The aunt is Jacqui's mother's younger sister and the uncle is jacqui's oldest uncle. They live in a small kampung (village) north of Alor Setar. We got there shortly after 1 PM and we spent the next 24 hours eating non-stop. 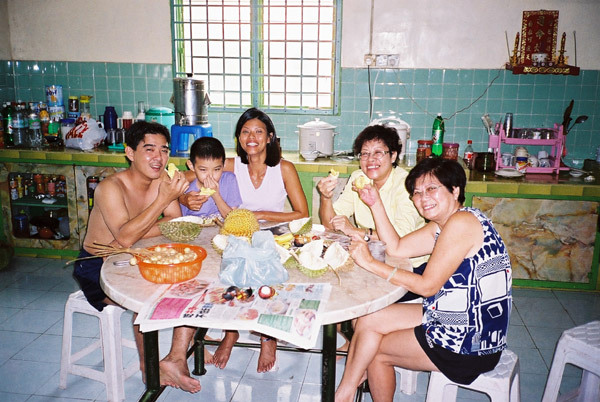 Once we got there, the food came out and we were at the dining table most of the time while we there visiting. They brought out some durian, the King of Fruits, which was a hit with most people. As you can see, however, it was not a hit with one of the nephews - he his holding his nose to try to avoid the smell (a hopeless cause). You either love it or hate it! After dinner we drove into Alor Setar and walked around one of the shopping centers. Before they took us home, however, we had to have supper. So, after a bit of driving around to find a place open at around 11 PM, we stopped at a small outdoor place. While it was supposed to be a light snack, a lot of food was offered and, as it was very good, most was eaten. Back at the kampung, we hung around talking until about 3 AM. The next day, after we got up around 9 AM, they were able to fit about 3 meals into us before we headed back to Penang around 1 PM. It was a great visit and we were able to stuff ourselves on good home cooked Asian food prior to leaving for the Americas for 7 months.